This is the first book-length work to reflect the recent trend in social psychology away from artificial laboratory test results. It focuses directly on the detailed, concrete elements of social behavior as they are observed in a real-life setting. Michael Argyle's approach here differs from that more generally taken in two respects. First, he discusses human interaction in terms of the basic elements of behavior-bodily and facial movements, gestures, eye-movements, facial expression, proximity, and orientation, the verbal and non-verbal aspects of communication. Second, he has drawn on research in such varied areas as psychiatry, anthropology, linguistics, ethology, developmental and organizational psychology, as well as on his own extensive experimental studies. Particular emphasis is given to the biological roots of interaction, and to its cultural setting. 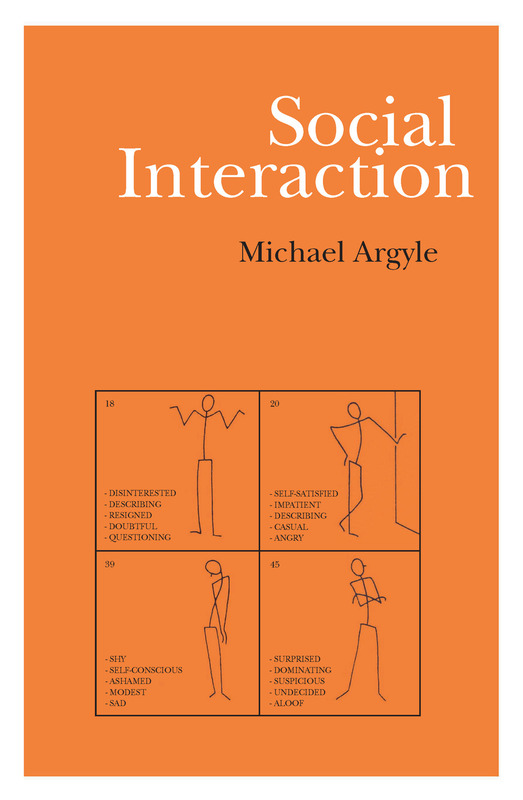 Social Interaction demonstrates a strong awareness of the current theories of social psychology, while restricting itself in exposition to the observable aspects of human interaction. The result is a comprehensive and stimulating introduction to social interaction. This is primarily a textbook for students of social psychology, but it covers a field that is of central importance for all students of the social and biological sciences.